When the San Francisco Chronicle identified the Bay Area’s “Top 25 Lawyers” last year, it was no surprise that they described Walkup, Melodia, Kelly & Schoenberger as “Perhaps the pre-eminent personal injury firm in the Bay Area”. Whether the dispute involves product liability, medical negligence, medical device failure, consumer protection, vehicle collisions, aviation accidents or workplace injuries, for over 40 years the Walkup firm has prided itself on being Northern California’s best known plaintiff’s personal injury firm. Validation of this stature is found in the selection of four of its members as Northern California Super Lawyers. Since 1959, Walkup lawyers have stood out as tough, creative and ethical advocates. Whether in trial, arbitration, or mediation, firm lawyers consistently earn high levels of client satisfaction. Our Super Lawyers include Paul Melodia, the acknowledged dean of Northern California medical negligence lawyers; Michael A. Kelly, a two-time nominee as “Trial Lawyer of the Year” by the San Francisco Trial Lawyers Association and a member of the Board of Trustees of the National Institute of Trial Advocacy; Richard H. Schoenberger, one of San Francisco’s finest civil trial lawyers and a nationally recognized teacher of trial advocacy; and Matthew Davis, a former Deputy City Attorney who has fashioned an outstanding track record of success in consumer class action and government liability cases. Our Super Lawyers are members and leaders of such organizations as the American Board of Trial Advocates, the International Society of Barristers, the International Academy of Trial Lawyers, the “Best Lawyers in America”, The National Institute of Trial Advocacy, and the American College of Trial Lawyers. We serve on Bar committees, belong to local Inns of Court, participate in judicial selection committees, and serve as volunteers on alternative dispute resolution panels. Both the popular press and legal periodicals have profiled the firm’s many successes — and with good reason. Walkup lawyers approach all cases the same way — thorough preparation and an intention to try the case if it cannot be resolved on terms beneficial to the client. 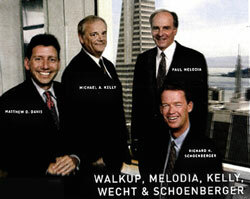 When clients hire Walkup, they benefit from the resources of Northern California’s premier personal injury firm. Since 1990, verdicts, settlements and arbitration awards obtained on behalf of our clients have exceeded $275,000,000. Where other lawyers hesitate we embrace the opportunity. DISCLAIMER: The material on this website is for informational purposes only. It may be out of date, incomplete or incorrect. It does not constitute legal advice. A verdict, settlement or result described here should not be considered an indication of future results. All cases are different. The only similarity among the case results reported here is that the plaintiffs were represented by the attorneys of Walkup, Melodia, Kelly and Schoenberger. The internet is not an appropriate place for sensitive attorney-client communications. Therefore, if you wish to speak to an attorney, please arrange for an appointment by phone, fax or email. An attorney client relationship does not exist between you and this law firm until a retainer agreement has been signed. Links from this website to other sites are not intended to be referrals or endorsements of the linked materials.